Cytosine methylation is an important chromatin modification that maintains genome integrity and regulates gene expression through transcriptional gene silencing. Major players in de novo methylation guided by siRNAs (known as RNA-directed DNA methylation, or RdDM), maintenance methylation, and active demethylation have been identified in Arabidopsis. However, active demethylation only occurs at a subset of RdDM loci, raising the question of how the homeostasis of DNA methylation is achieved at most RdDM loci. To identify factors that regulate the levels of cytosine methylation, we aimed to establish a transgenic reporter system that allows for forward genetic screens in Arabidopsis. We introduced a dual 35 S promoter (d35S) driven luciferase reporter, LUCH, into Arabidopsis and isolated a line with a moderate level of luciferase activity. LUCH produced transgene-specific 24 nucleotide siRNAs and its d35S contained methylated cytosine in CG, CHG and CHH contexts. Treatment of the transgenic line with an inhibitor of cytosine methylation de-repressed luciferase activity. Mutations in several components of the RdDM pathway but not the maintenance methylation genes resulted in reduced d35S methylation, especially CHH methylation, and de-repression of luciferase activity. A mutation in MOM1, which is known to cooperate with RdDM to silence transposons, reduced d35S DNA methylation and de-repressed LUCH expression. A mutation in ROS1, a cytosine demethylation enzyme, increased d35S methylation and reduced LUCH expression. We developed a luciferase-based reporter, LUCH, which reports both DNA methylation directed by small RNAs and active demethylation by ROS1 in Arabidopsis. The moderate basal level of LUCH expression allows for bi-directional genetic screens that dissect the mechanisms of DNA methylation as well as demethylation. Cytosine methylation is a major epigenetic mechanism that establishes transcriptional gene silencing (TGS) to maintain genome integrity and regulate gene expression in plants and mammals (reviewed in ). Well-known biological phenomena involving DNA methylation as an underlying mechanism include imprinting, paramutation and X chromosome inactivation. In plants, transposons and repetitive elements are methylated, thereby keeping transposons silenced and immobilized and consequently protecting the genome from damage by these mobile elements. Also, when transposons or repeats are located in the regulatory regions of genes, DNA methylation at the transposons or repeats may influence the transcription of the nearby genes through TGS. The enzymes that initiate, maintain, and erase DNA methylation in Arabidopsis have been identified and characterized (reviewed in ). De novo DNA methylation, also known as RNA-directed DNA methylation (RdDM), requires DOMAIN REARRANGED METHYLTRANSFERASE2 (DRM2), which is guided to specific genomic loci by 24 nucleotide small interfering RNAs (siRNAs). siRNAs are synthesized from repeats and transposons in an RNA polymerase IV (Pol IV)-, RNA DEPENDENT RNA POLYMERASE2 (RDR2)-, and DICERLIKE3 (DCL3)-dependent manner. Pol IV is thought to transcribe these loci into single-stranded RNAs, which are then rendered double-stranded by RDR2. DCL3 dices the double-stranded RNAs into 24 nucleotide siRNAs, which are loaded into the ARGONAUTE4 (AGO4)-clade of AGO proteins (reviewed in ). Base-pairing between the AGO4-loaded siRNAs and nascent transcripts produced by Pol V is thought to recruit AGO4/siRNAs and DRM2 to the RdDM targets, resulting in de novo methylation in a sequence-specific manner (reviewed in ). After the initial establishment of DNA methylation, hemimethylated cytosines in CG and CHG contexts resulting from DNA replication are fully methylated by METHYLTRANSFERASE1 (MET1) and CHROMOMETHYLTRANSFERASE3 (CMT3), respectively (reviewed in ). The positive feedback loop in which DNA methylation promotes siRNA biogenesis, which guides de novo DNA methylation, needs to be kept in check to prevent the expansion of heterochromatin and the sporadic silencing of genic regions. One such mechanism is DNA demethylation. Four DNA glycosylase/lyase enzymes remove methyl cytosine through a base excision repair mechanism (reviewed in ). DEMETER establishes imprinting during female gametogenesis and REPRESSOR OF SILENCING1 (ROS1), DEMETER-LIKE2 (DML2) and DML3 prevent hypermethylation in vegetative tissues. Although the enzymes that deposit or erase DNA methylation are known, how these enzymes are regulated to achieve the proper homeostasis of DNA methylation is still nebulous. Although demethylation can keep DNA methylation in check, whole genome bisulfite sequencing in the ros1 dml2 dml3 triple mutant revealed that only a few hundred loci are hypermethylated  and are thus targets of demethylation. Since thousands of loci harbor DNA methylation, generate siRNAs and are targets of RdDM, it remains to be determined how most RdDM loci achieve homeostasis of DNA methylation. It is likely that other, as yet unknown, mechanisms prevent the hypermethylation of RdDM loci. In addition to the RdDM pathway, MORPHEUS’ MOLECULE1 (MOM1) impacts TGS in a complex manner usually without affecting the levels of cytosine methylation at target loci [5–7]. It encodes a protein with similarities to chromatin remodeling ATPases and silences endogenous loci and transgenes by an unknown mechanism . MOM1 exhibits a complex relationship with RdDM depending on the target loci . It functions either in the same pathway as RdDM or in a parallel pathway, or it could even antagonize the silencing by RdDM. Some loci are transcriptionally suppressed by MOM1 independently of RdDM. Forward genetic screens in Arabidopsis can help reveal mechanisms that regulate DNA methylation. In fact, most of the currently known genes involved in DNA methylation or demethylation were uncovered through genetic screens. However, most prior genetic screens were based on the isolation of mutations that release RdDM to result in de-repressed reporter gene expression, thus precluding the identification of negative regulators of DNA methylation. So far, the only known negative factors in DNA methylation, ROS1 and ROS3 (a protein required for ROS1-mediated demethylation), were isolated from genetic screens using the RD29A::LUC transgene system [8, 9]. Therefore, RD29A::LUC happens to be a target of ROS1-mediated demethylation. As mentioned above, the relatively lower number of ROS1/DML2/DML3 target loci in the genome as compared to the number of RdDM loci suggests the presence of unknown negative factors for methylation acting independently of, or in combination with, active demethylation by ROS1/DML2/DML3. Consequently, it is valuable to develop additional RdDM reporter transgenes inserted into different genomic locations to allow for the identification of these negative players. Here, we report the establishment of a firefly LUCIFERASE (LUC)-based reporter transgene driven by a dual 35S promoter that harbors DNA methylation in CG, CHG, and CHH contexts in Arabidopsis. We show that LUC expression is repressed mainly through CHH methylation in an RdDM-dependent manner. MOM1 also plays a role in DNA methylation and TGS of the reporter. More importantly, the moderate level of basal LUC expression in wild-type plants allows for genetic screens that aim at the isolation of mutants with not only defective but also enhanced DNA methylation. In fact, a ros1 allele with reduced transgene expression was isolated using this system. The reporter line will prove to be an effective tool in dissecting the mechanisms that regulate DNA methylation. Initially, we aimed to establish a LUC-based transgene that reported both TGS by RdDM and post-transcriptional gene silencing by miRNAs to allow for forward genetic screens. A transgene was constructed such that LUC was C-terminally fused in frame to the partial AP2 fragment containing the miR172 binding site  and the transgene was driven by a dual 35S promoter, which will be referred to as d35S, from Cauliflower Mosaic Virus (d35S::LUC-AP2). In the same vector, d35S-driven NEOMYCIN PHOSPHOTRANSFERASE II (d35S::NPTII) served as a selectable marker for plant transformation (Figure 1). This construct was introduced into the rna-dependent rna polymerase6–11 (rdr6–11) [11–13] mutant background to prevent sense transgene post-transcriptional silencing (S-PTGS; [11–13]) and one line with moderate levels of LUC signal was isolated to enable bidirectional genetic screens based on higher or lower LUC signals. The d35S::LUC-AP2 transgene in this line was named LUCH (LUC repressed by CHH methylation), as we found later that it was repressed by CHH methylation in d35S. LUCH was a one-copy insertion at a single genomic locus according to Southern blot analysis using the LUC sequence as a probe (Additional file 1: Figure S1). Thermal asymmetric interlaced PCR (TAIL-PCR) followed by sequencing revealed that the transgene resided 20 nucleotides before the stop codon of At3g07350, a gene of unknown function. This insertion did not cause any obvious morphological phenotypes. Structure of LUCH and its neighboring transgene. RB and LB, right border and left border of the T-DNA, respectively. The arrows indicate the directions of the coding regions. The d35S fragments (marked #1 to #3) specific for the d35S promoter upstream of LUC are amplified by PCR following digestion with the restriction enzyme McrBC as well as in bisulfite sequencing. Since LUCH contained a miR172 binding site, we first investigated whether it was able to report miRNA activity. If it were repressed by miR172, we would expect mutations in miRNA biosynthesis genes (reviewed in ), such as DICERLIKE1 (DCL1), HYPONASTIC LEAVES1 (HYL1), and SERRATE (SE) to de-repress LUCH expression. In the F2 population of LUCH crossed to dcl1–7, LUC luminescence was moderately increased in 12 out of 216 segregating seedlings (Additional file 1: Figure S2A). Since LUCH and DCL1 are not linked, the small proportion of seedlings with the moderately high LUC luminescence was not consistent with dcl1–7 being able to de-repress LUCH expression. Indeed, genotyping confirmed that only one of the 12 was homozygous for dcl1–7, and three of the 12 were homozygous for the wild-type DCL1 allele. Therefore, the moderate increase was likely due to inherent variations in LUCH expression or other background mutations. hyl1 and se-1 mutations also failed to increase LUC luminescence [see Additional file 1: Figure S2B and S2C. These results demonstrate that LUCH was unable to report miRNA activities even though the LUC transcript contains a miRNA-binding site in the 3′ UTR. To evaluate whether LUCH was repressed by RdDM-mediated TGS, we first examined whether LUCH had the molecular characteristics associated with RdDM. When compared with other reporter systems (NOSpro and α’pro[15, 16]), d35S is more than twice as long as those promoters but has a similar percentage of GC content. d35S has a relatively high non-CG composition (23 CG, 19 CHG and 138/128 CHH in forward/reverse strands), which was also observed in the α’pro system that was reported to be more sensitive to the regulation by RdDM than NOSpro[15, 16]. McrBC-PCR was conducted using primers that specifically amplified the d35S in LUCH instead of that in d35S::NPTII to evaluate the DNA methylation status of the LUCH transgene. The results showed that d35S was methylated whereas the LUC coding region was not (Figure 2A). Bisulfite sequencing revealed the presence of DNA methylation in CG, CHG, and CHH contexts (Figure 2B). The levels of CHH methylation were 22%, which was particularly high compared to other previously established reporter lines of RdDM. For example, the clk-sk line had 15% CHH methylation in the SUPERMAN 5′ region ; the RD29A::LUC line had 1% and 6% CHH methylation in the RD29A promoter in wild type and ros1, respectively . Treatment of LUCH seedlings with 5-aza-2′-deoxycytidine, an inhibitor of cytosine methylation increased LUC luminescence and LUC transcript levels, indicating that cytosine methylation transcriptionally silenced LUCH expression [see Additional file 1: Figure S3. Molecular characteristics of LUCH associated with RdDM. (A) Analysis of DNA methylation in the d35S and the LUC coding region in LUCH by McrBC-PCR. The two d35S fragments are as diagrammed in Figure 1. − and + indicate McrBC-untreated and treated genomic DNA, respectively. ‘H2O’ is a negative control PCR without genomic DNA. McrBC digests methylated DNA to result in reduced PCR product amounts. (B) Bisulfite sequencing analysis of cytosine methylation in d35S in LUCH in wild type and ago4–6. The top strand of d35S #3 in Figure 1 was analyzed. (C) d35S-specific siRNA accumulation in the LUCH line as detected by northern blotting. The numbers indicate the amount of enriched small RNAs loaded into the gel. Col-0, wild type (with no transgene). Next, since RdDM target loci produce siRNAs, we determined the accumulation of siRNAs from the LUCH and d35S::NPTII transgenes. Even though we did not artificially introduce any hairpin source of d35S-specific siRNAs, siRNAs were detected in the LUCH line by northern blotting using a d35S-specific probe (Figure 2C). High throughput sequencing was conducted to examine the small RNAs from the transgenes in more detail. siRNAs mapping to both DNA strands of the two transgenes were found; and 22 nucleotide siRNAs were the most abundant small RNA species [see Additional file 1: Figure S4A and S4B]. Even though LUCH was introduced into rdr6–11 to prevent S-PTGS by blocking the biogenesis of secondary siRNAs, 21 nucleotide and 22 nucleotide siRNAs mapping to the transgene were present, which suggests that PTGS was still occurring. Perhaps the siRNAs were primary siRNAs resulting from sense and antisense transcription from the locus or secondary siRNAs from the activities of RDR2. Twenty four nucleotide siRNAs, which are associated with RdDM, were also present. Among 18 to 27 nucleotide small RNAs that mapped to d35S in LUCH, 24 nucleotide siRNAs accounted for approximately 19% of the total [see Additional file 1: Figure S4A]. The d35S promoters driving LUC and NPTII were 96% identical in sequences. We took advantage of the sequence differences to determine whether both regions generated siRNAs. Indeed, siRNAs specific to each d35S were found [see Additional file 1: Figure S4C; Additional file 2], indicating that each d35S gave rise to siRNAs. The reverse strand 24 nucleotide siRNAs were similar in quantity between the two transgenes (123 and 106 reads for LUCH and d35S::NPTII, respectively). Interestingly, forward strand 24 nucleotide siRNAs were different in quantity between the two transgenes: 509 and 120 reads were from d35S::NPTII and LUCH, respectively. The abundance of d35S::NPTII-specific siRNAs was attributed to both higher diversity of siRNA species and higher levels of a subset of species [see Additional file 2]. The basis for the differential siRNA levels is unknown but may be due to differences in read-through transcription at the two d35S. Taken together, LUCH exhibits the molecular characteristics associated with RdDM, such as CHH methylation and 24 nucleotide siRNA production. The regulation of LUCH by RdDM was further supported by the fact that mutations in known RdDM pathway components de-repressed LUCH expression. We mutagenized the LUCH line with either ethyl methanesulfonate (EMS) or T-DNA and searched for mutants with higher LUC luminescence (Figure 3A). Genetic analyses demonstrated that each mutant with high LUC luminescence harbored a single, recessive mutation. Map-based cloning revealed that the mutations were in HUA ENHANCER1, AGO4, DRM2 and DEFECTIVE IN RNA-DIRECTED DNA METHYLATION1 (DRD1) [see Additional file 1: Figure S5, which are known genes in the RdDM pathway (reviewed in ). In addition, introducing nrpe1–1, a mutant of the largest subunit of Pol V (reviewed in ), into LUCH de-repressed LUC luminescence (Figure 3A). These mutants had higher levels of LUC transcripts as revealed by RT-PCR (Figure 3B), indicating that the de-repression of LUCH expression was at the transcriptional level. Since both LUC and NPTII are under the regulation of d35S, we analyzed the expression levels of NPTII by RT-PCR. The NPTII transcript levels were also increased in these RdDM mutants (Figure 3B). We next analyzed the DNA methylation status of d35S in these mutants. Southern blot analysis with a d35S-specific probe showed that d35S-specific bands were downwardly shifted in ago4–6, drd1–12 and drm2–6 [see Additional file 1: Figure S6, indicating that DNA methylation at d35S was reduced in ago4–6, drd1–12 and drm2–6. Bisulfite-sequencing with primers that allowed only amplification of the d35S in LUCH showed that the levels of DNA methylation were decreased in all sequence contexts in ago4–6, with CHH methylation being the most drastically decreased (Figure 2B). These results show that LUCH is repressed by de novo DNA methylation at d35S and the repression requires RdDM components. 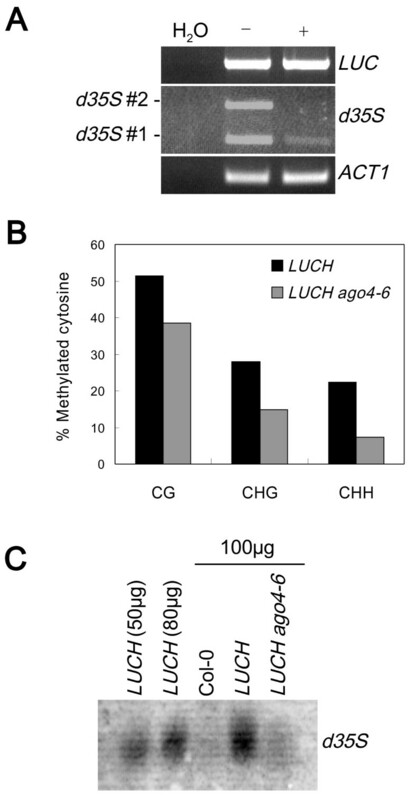 To evaluate whether maintenance methylation at CG and CHG contexts by MET1 and CMT3, respectively, contributes to the repression of LUCH, we crossed met1–3 and cmt3–7 mutations into LUCH. met1–3 or cmt3–7 did not affect LUCH expression [see Additional file 1: Figure S7, indicating that this reporter line was mainly repressed by de novo methylation through DRM2. These molecular and genetic results demonstrate that LUCH faithfully reports RdDM-mediated TGS. The RdDM pathway is genetically required for the suppression of LUCH expression. (A) De-repression of LUC luminescence in various RdDM mutants. Each spot represents an Arabidopsis seedling. The brighter the spots, the higher the LUC luminescence. Col-0, wild type (with no transgene). (B) RT-PCR of LUC and NPTII in various RdDM mutants. UBQ5 serves as a loading control. RT (−), UBQ5 RT-PCR in which the reverse transcription was conducted in the absence of the reverse transcriptase. (C) Analysis of cytosine methylation in the d35S in LUCH in ago4–6, ros1–5 and mom1–5 mutants by McrBC-PCR. ACT1 serves as an internal, unmethylated control. Our genetic screen also resulted in the isolation of a new mom1 allele (mom1–5) that displayed de-repressed LUC luminescence (Figure 4A; [see Additional file 1: Figure S5]). RT-PCR confirmed the increased levels of LUC and NPTII transcripts and the absence of MOM1 transcripts in the mutant (Figure 4B). DNA methylation at d35S was moderately decreased in mom1–5, as revealed by McrBC-PCR and Southern blot analysis (Figure 3C; [see Additional file 1: Figure S6]). The reduction in DNA methylation in mom1–5 was less severe than in RdDM mutants [see Additional file 1: Figure S6]. Nonetheless, this shows that the DNA methylation and TGS of LUCH require MOM1. LUCH is regulated by MOM1. 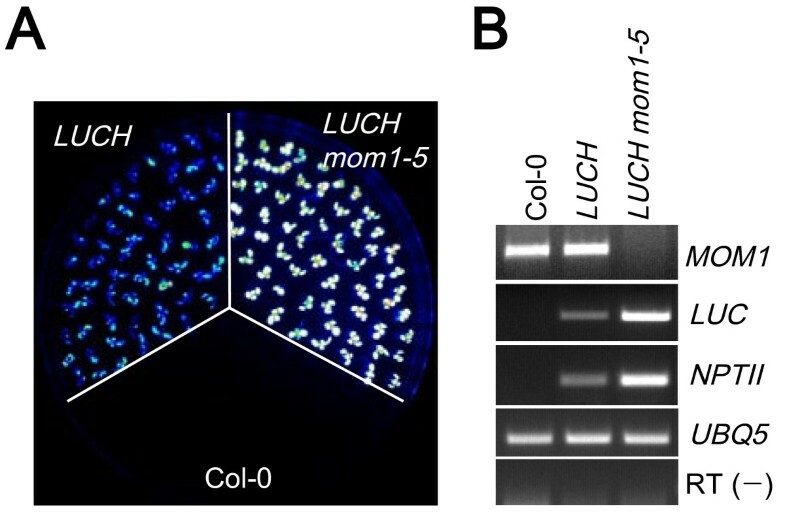 (A) De-repression of LUC luminescence in LUCH mom1–5. (B) RT-PCR of LUC, NPTII and MOM1 in wild type (Col-0), LUCH and LUCH mom1–5. A major motivation to establish a LUC-based reporter was to enable the screening for mutants with enhanced silencing. The LUCH line, which exhibited a moderate basal level of LUC luminescence, was suitable for such a purpose. We performed T-DNA insertional mutagenesis of the LUCH line and isolated a recessive mutant allele with lower levels of LUC luminescence (Figure 5A). Map-based cloning identified this mutant as a new allele of ROS1 [see Additional file 1: Figure S5], a gene required for DNA demethylation. This suggested that loss of demethylation resulted in the accumulation of cytosine methylation in d35S and reinforcement of TGS of LUCH. Indeed, there was an increase in DNA methylation of d35S in LUCH in ros1–5 according to McrBC-PCR (Figure 3C). Levels of LUC and NPTII transcripts were decreased as determined by RT-PCR (Figure 5B). In addition, treatment of LUCH ros1–5 seedlings with 5-aza-2′-deoxycytidine increased the expression of LUCH to wild-type levels [see Additional file 1: Figure S3], which further supported the notion that increased DNA methylation in ros1–5 led to enhanced TGS of LUCH. Therefore, even though LUCH is transcriptionally repressed by RdDM, the basal expression of LUCH is relatively high such that the transgene can be used to screen for mutants with enhanced silencing. 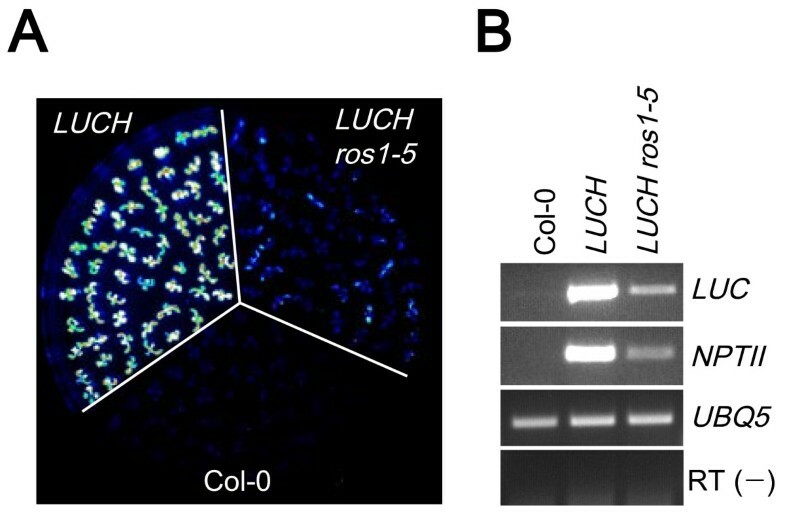 LUCH is targeted by ROS1 -mediated DNA demethylation. (A) Reduction of LUC luminescence in LUCH ros1–5. Note that the images were taken with the same exposure conditions as in Figures 3A and 4A, but LUCH appeared much brighter here because the contrast was adjusted to better reflect the differences between LUCH and LUCH ros1–5. (B) RT-PCR of LUC and NPTII in wild type (Col-0), LUCH and LUCH ros1–5. We developed a transgenic LUC reporter system that reports both TGS by RdDM and MOM1, and ROS1-mediated demethylation. Moderate expression of the reporter enables genetic screens in two directions to isolate mutants with decreased as well as increased DNA methylation. Considering that existing TGS reporter systems, such as the NOSpro, α’pro, and clk-sk lines, are mainly suitable for the isolation of positive players in RdDM, LUCH is a useful genetic resource for the identification of negative players in RdDM, for which nothing is known. Moreover, LUCH will potentially contribute to the better understanding of MOM1-mediated TGS or the mechanisms of active demethylation. For the latter, although RD29::LUC reports ROS1-mediated DNA demethylation, as a second reporter of ROS1-mediated demethylation residing at a different genomic location, LUCH will enrich our resources to tackle the mechanisms of demethylation. Arabidopsis mutants used in this study were rdr6–11 , dcl1–7 , se-1 , hyl1 , met1–3 , cmt3–7  and drd3–1  and newly isolated drm2–6, ago4–6, drd1–12, hen1–9, ros1–5 and mom1–5. For map-based cloning of newly isolated mutants, LUCH rdr6–11 in the Columbia-0 (Col-0) accession was introgressed into Landsberg erecta (Ler) by backcrossing to Ler five times and one line with a similar level of LUC activity as LUCH in Col-0 was isolated. The isolated mutants from LUCH rdr6–11 in Col were each crossed to LUCH rdr6–11 in Ler, and in the F2 population, seedlings with high (for drm2–6, ago4–6, drd1–12, hen1–9, and mom1–5) or low (ros1–5) luciferase activities were identified and served as the mapping population. Polymorphisms between Col-0 and Ler were utilized to map and clone the genes. Arabidopsis thaliana seeds were surface-sterilized, planted on MS-agar plates containing 1% sucrose, and stratified at 4 °C for three days. Seedlings were grown at 23 °C under continuous lights for ten days. All experiments were performed with ten-day old seedlings unless otherwise specified. For luciferase live imaging, 1 mM luciferin (a substrate of luciferase; Promega, Madison, Wisconsin, USA) in 0.01% Triton X-100 was sprayed onto the seedlings, which were then transferred to a Stanford Photonics Onyx Luminescence Dark Box. Luciferase images were taken with a Roper Pixis 1024B camera controlled by the WinView32 software at a two minute exposure time. Identical exposure conditions were used to capture all images in this study. The images were displayed and analyzed with WinView32 such that image contrast was adjusted to effectively distinguish the difference in intensities between different lines within a plate as previously described . The LUC coding region was amplified using the Rlucp1 and Rlucp2 primers and pRL-SV40 (Promega) as the template. d35S::LUC was constructed by replacing GFP in pAVA321  with the LUC coding region using NcoI and BamHI restriction sites. The d35S::LUC cassette was cloned into the pPZP211  at the SalI and BamHI restriction sites. An AP2 fragment including the miR172 binding site was amplified from Col-0 genomic DNA with the primers AP2p26 and AP2p28 and inserted downstream of d35S::LUC in pPZP211 using BamHI and EcoRI to generate d35S::LUC-AP2, which will be referred to as LUCH. The construct was introduced into rdr6–11 plants by Agrobacterium tumefaciens-mediated transformation. Southern blot analysis was performed according to the standard protocol  to evaluate the copy number of LUCH using the full-length LUC coding region as the probe. The probe was amplified with the primers lucp6 and lucp7, and radiolabeled with the RPN1633 Rediprime II Random Prime Labeling System (GE Healthcare Biosciences, Pittsburgh, Pennsylvania, USA). TAIL-PCR was performed as described . Primers used are listed in Additional file 3: Table S1. For the McrBC-PCR assay, two reactions were set up for each genomic DNA sample: McrBC-treated and untreated reactions. A total of 300 ng genomic DNA was digested with 3 units of McrBC (New England Biolabs, Ipswich, Massachusetts, USA) for 25 minutes at 37 °C in a 20 μl reaction. Using 1 μl (15 ng) of restricted genomic DNA as the template, genomic regions corresponding to d35S or full length LUC in the LUCH transgene were amplified using the 35Sf and LUC 0.13 k R primers or the lucp6 and lucp7 primers, respectively. ACT1 was amplified with the Actin1-F and Actin1-R primers and used as a loading control. PCR products were analyzed on a 2% agarose gel stained with ethidium bromide. For Southern blot analysis, 15 μg of genomic DNA was digested with AluI (NEB) and hybridization was performed following standard methods . The d35S promoter was PCR-amplified with the 35Sf and 35Sr primers and radiolabeled using the RPN1633 Rediprime II random prime labeling system (GE Healthcare). For bisulfite sequencing, 1 μg of genomic DNA was subjected to bisulfite conversion using the EpiTect Bisulfite Kit according to the manufacturer’s instructions (Qiagen, Hilden, Germany). Converted DNA was subjected to PCR reactions with primers YZ 35 S Bis F and YZ LUC Bis R and the PCR products were cloned into the pGEM-T Easy vector (Promega). At least 26 colonies were sequenced for each sample. Unique clones were obtained and analyzed for DNA methylation with Kithmeth (http://katahdin.mssm.edu/kismeth/revpage.pl) . For 5-aza-2′-deoxycytidine (Sigma, St. Louis, Missouri, USA) treatment, seeds were germinated and grown on MS-agar medium containing 7 μg/ml of the chemical for two weeks and luciferase images were taken. Primers used are listed in Additional file 3: Table S1. RNA isolation and hybridization to detect small RNAs were performed as described previously . To detect siRNAs from the d35S promoter, a DNA fragment was amplified from the d35S promoter using the 35Sf and 35Sr primers and cloned into the pGEM-T Easy vector (Promega). The plasmid was linearized by SpeI (NEB) and used as a template for in vitro transcription with T7 RNA polymerase (Promega) in the presence of [α-32P] UTP. The labeled in vitro transcripts were used as the probe in northern blotting. Radioactive signals were detected with a Phosphorimager. For small RNA deep sequencing, a small RNA library was constructed using the TruSeq Small RNA Sample Prep Kit (Illumina, San Diego, California, USA) according to the manufacturer’s instructions with some modifications. Instead of total RNA, 15 to 40 nucleotide long RNAs were used as the starting material. The small RNA library was sequenced by Illumina Hiseq2000 at the genomics core facility at the University of California Riverside. After the raw reads were filtered by the Illumina quality control pipeline and the adaptor sequences were trimmed, 14,363,865 reads between 18 nucleotides and 28 nucleotides were matched to the Arabidopsis genome (TAIRv10) as well as the transgenes with SOAP2 . A total of 8,710,699 and 22,245 reads were mapped to the Arabidopsis genome and the transgenes, respectively, with no mismatches. cDNA was synthesized from 5 μg of DNaseI (Roche, Basel, Switzerland)-treated total RNA using Reverse Transcriptase (Fermentas, Burlington, Ontario, Canada) and oligo-dT (Fermentas) as the primer. Using cDNA and gene-specific primers, PCR was performed and RT-PCR products were analyzed on a 2% agarose gel stained with ethidium bromide. The sequences of primers are listed in Additional file 3: Table S1. The work was supported by grants from the National Science Foundation (MCB-1021465) and the National Institutes of Health (GM061146) to X.C. The work was also supported by the Howard Hughes Medical Institute and the Gordon and Betty Moore Foundation. TD was supported by an NSF ChemGen IGERT program (DGE0504249). XZ was the recipient of a Chinese Academy of Sciences visiting scholar fund. HY was supported by funds from the China Scholarship Council. SYW and XC wrote the manuscript. SYW did the RT-PCR, McrBC-PCR, 5aza-dC treatments, the genetic analysis of LUCH, and identified two mutants to be drm2–6 and ros1–5 through map-based cloning. SL performed the siRNA northern blot, Southern blot analysis and TAIL-PCR and mapped the drd1–12 mutant. BZ transformed the reporter construct and selected the LUCH line. YZ mapped ago4–6. XZ mapped mom1–5 and performed Southern blot analysis. DL mapped hen1–9 and constructed the small RNA library. HY did McrBC-PCR. LG analyzed the small RNA library data. TTD did bisulfite sequencing. XC constructed the reporter plasmid, conceived and guided the project. All authors read and approved the final manuscript.